The general feeling in many gaming communities right now probably involves some combination of the following words: “hatch”, “count”, “don’t”, “chickens”, “before”, “your”, and “they”. I am of course referring to the fallout from the release of space-ploration game No Man’s Sky, which has reminded us once a-freakin-gain that hype generated from a bunch of sub-ten-minute “gameplay” trailers is not hype that can be trusted. And now here we are, left to watch a game that once had so much promise slowly inherit the title of “The Phantom Menace of video gaming” from Ubisoft’s car-wreck/game hybrid, Watch_Dogs. But. I’m not here in the same capacity as one of those “Ha! Told you so” types currently roaming the wilds of the internet, proclaiming at the top of their lungs that they were just way too cool and unique and interesting to be interested in No Man’s Sky to begin with. After all, I bought into the hype too. In fact, I bought into the hype so much that even though I haven’t bought No Man’s Sky yet, I know that I’m still going to buy it, because even a few hours of face-in-hands-disappointing space travel will be enough to validate my years of salivating over retrospectively-laughable trailers. And look, nor am I here to throw another piece into this not-entirely-new games journalism sub-genre of ‘reasons why we should never give into hype ever again lest the entire fabric of society break down and we all revert into gibbering chimp-forms left to wander the earth in pain and misery for the rest of time’. Of course not. Call me an optimist: I prefer a long period of hype followed by crushing disappointment than a long period of cynicised (I made that word up), boring hype-resistance (we all have that one friend who loves nothing more than to throw shade on games that haven’t yet been released and make fun of others for feeling hyped [which, if you think about it, is just as illogical as getting hyped, with the difference being that this person literally elects to act like a complete stooge]) followed by (maybe) pleasant surprise. To all of you who were stunned by E3 2k14’s No Man’s trailer, wasn’t that just the greatest day ever? Whether or not you were eventually satisfied with the game itself, can’t you look back on that and remember how great it was to witness, for the first time, such a spectacle? Who cares if the actual game ain’t as great as promised? In that moment, you felt great, I felt great, we all felt great. And that’s just great. With this in mind, let’s talk about Metal Gear: Survive. Or rather, let’s talk about why a game which is already on the receiving end of more than just a little bit of hate looks frikkin’ sick, bruh. For me, MGS(urvive) is The Phantom Pain without all the Hideo-Kojima-based expectations – and that’s a great thing. What we thought was going to be Guns of the Patriots but with base-management and juicy open-world stuff turned out to be a nonetheless incredible action game that, for the most part, barely resembled any of the previous entries in the series. The month-long cut-scenes had been replaced by dive-rolling into the sunset over and over again, and the stretches of back-and-forth text dialogue (that some say are still going to this day) had been replaced by literally a rocket-propelled remote-control robot fist. Not your pappy’s Metal Gear, as they say. And all of this made the game feel really quite jarring – not bad by any stretch of the word, just difficult to wrap one’s head around. It wasn’t the Solid we expected, and for some, it wasn’t the Solid we wanted. But taken as a pure stealth/action game, it was almost perfect. Survive doesn’t come with this sort of baggage. Hideo Kojima and his LSD-laced brain is no longer in the picture, meaning that aside from the few details provided by Konami thus far, we have no idea what to expect from the squad-based survive-‘em-up. Ever the optimist, I think this is a great thing. I’m sure I’m not the first person to have come to the realisation that The Phantom Pain’s game mechanics coupled with arena (probably, right?) survival is a match made in heaven. Frenetic survival shooting is something I’ve loved ever since Halo 3: ODST’s ‘Firefight’ mode, whose high-score chasing made for some of the best Halo/beer nights I’ve ever found myself lucky enough to participate in. Mass Effect 3’s take on the sub-sub-genre wasn’t half bad, either. Something something something Nazi Zombies something something. While these modes did a great job of introducing some frenetic gameplay into otherwise medium-paced shooters, there was plenty of scope for improvement – namely, in the number of approaches one could take when faced with a billion baddies. Typically, the best runs here come down to how well one can aim when pitted against a hundred bad guys and finite ammo pockets – and that’s about it. With Survive, however, I’m hoping to see some of Phantom Pain’s multiple-approach approach to gameplay. I want to be able to choose between stealth, RAMBOMODE, and anything in between. I want to be able to call in air support on my teammates (as a joke). I want to be able to say “tactical cardboard box assault pattern delta” and have my buddies know exactly what I’m talking about. I want to be able to hide under a table and use my aforementioned rocket-fist to take out enemies from afar. D-HORSE, SON. I want the kind of shopping list of possibilities that Phantom Pain’s addictive base-nicking brought to the table. I also want to jab zombie-aliens through a fence with a spear. And, single-trailer-and-press-release notwithstanding, I sincerely believe that I’ll be able to do all these things. So please. Let your imagination run wild. Hang on to every millisecond of the upcoming trailers. Scour the dregs of hastily-constructed fan-blogs (like this one) for morsel-sized details. Have the run-up to this game be just as fun and exciting as the run-up to the pathetically godawful No Man’s Sky. 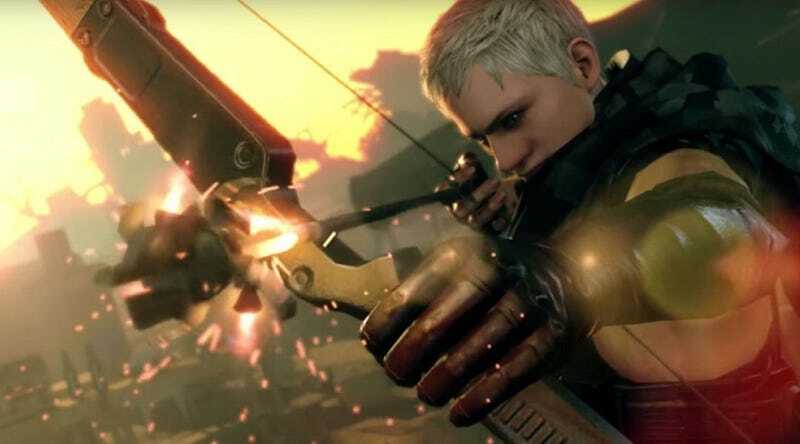 Metal Gear: Survive is going to be great. So get hype.